Clematis pitcheri T. & G.
Also Called: Pitcher's leather flower, bluebill, bluebell. Stems: Vine, somewhat woody, up to many feet in length, climbing on other vegetation or scrambling along ground, pubescent to glabrous. Leaves: Opposite, variable in shape, size and texture, pinnately-compound; leaflets 3-11, (usually 3-5), lance-ovate to cordate-ovate, firm, prominently net-veined, glabrous; surfaces green; margins entire but lowest and largest sometimes 2-3-lobed, occasionally deeply so; largest leaflets 1.2 to 3.6 inches long, 1 to 2+ inches wide; smaller leaflets often with tendril-like stalks; apical leaflet sometimes represented tendrils. Inflorescences: Solitary flowers, in leaf axils, long-stalked, nodding; pair of bracts near base. Flowers: Calyx urn-shaped; sepals 4, petal-like, .4 to 1.4 inch long, leathery, outer surface dull purplish, inner surface darker purple; margins pubescent; tips curved backward; petals absent; stamens numerous. Fruits: Achenes in spherical heads; each achene .3 to .5 inch long, silky-pubescent near base, tipped by persistent, tail-like style .4 to 1.2 inch long, curved, partially glabrous to silky-hairy. Habitat: Near streams, low or rocky open woods, thickets, fence rows; level ground or slopes; dry or moist soils. Comments: Named for Zina Pitcher, 1797-1872, botanist, physician, and mayor of Detroit. The mature achenes can be planted, but the soil must be deep and rich. 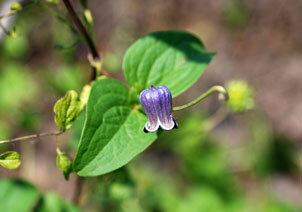 Pitcher's clematis is pollinated by bees.